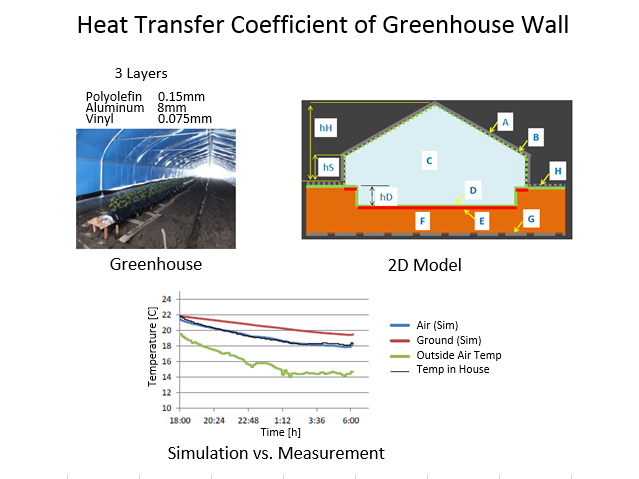 ﻿﻿ Heat Transfer Coefficient of Greenhouse Wallexplanation｜products｜Murata Software Co., Ltd. Thermal insulation was compared among 3 kinds of greenhouse walls. The temperature data over five days were taken for each greenhouse wall, and the heat transfer was simulated with 2D analysis models. The results showed that the thermal insulation of the 3-layer wall is effecive 6 times the single-layer wall. See other Thermal Analysis applications.